here are two sites where you will find some(sat data) of Raoul MAUJEAN(my best friend,Mauritius, hrpt polar sation and hres geo station)and mine . Hi to Michael Bath. How are you faring? Probably a java script problem not being rendered correctly. Download the latest version and see if that cures it. If not jump onto the Firefox whinge fest I mean forum (there should be an inbuilt link in the FF menu somewhere) and see what else it could be. I thought some of you who are into the mathematics behind meteorology might enjoy this very interesting paper about the influence that the ocean has upon atmospheric global circulations and short range climatic fluctuations. If this is not the right thread for such material-please advise. Here is an excellent link for those new to Meteorology. This answers all (or most) of your questions about identifying a TC. Note: circulation is opposite in southern hemisphere. 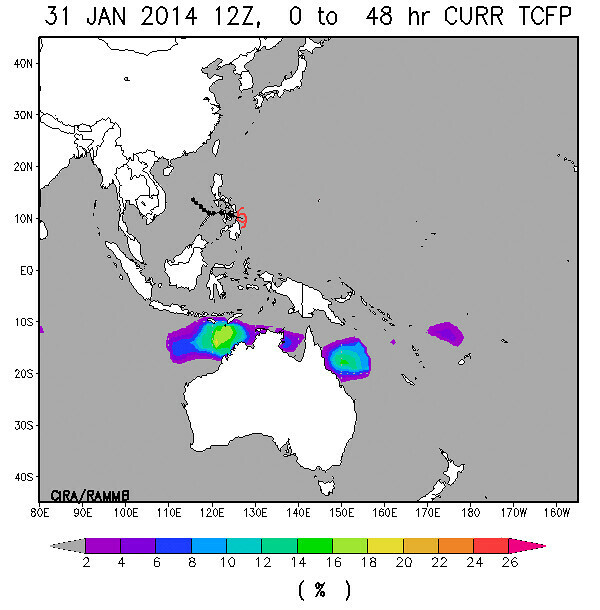 Very interesting and informative link, there, to give people a grounding in tropical weather. For Australian readers, though, it would need to be read together with the BoM's cyclone information pages, including this one "About Tropical Cyclones"
Download the add on for your browser. By the way this is the way of the future- applications will be a thing of the past as I reported to you last week about Windows 7- good luck and enjoy it... you will be totally amazed if you haven;t tried it. If you want to save your favourites you have to register but so what- ENJOY my weather friends. 1) 17 - 19 March, 1864. The first recorded in Queensland. Gales in Brisbane. Damage to stores, houses, signs trees and gardens blown away. Stone jetty at Cleveland washed away. Wind and rain damage at Toowoomba and Gladstone. 2) 2 - 3 March, 1867. Gale winds at Bowen with buildings damaged. Boats smashed. Townsville hit with ever third building blown down. 3) 26 - 28 April, 1867. Southeast Queensland flooded. Wharves covered in Brisbane. Brisbane, Logan and Ipswich suffer structural and tree damage. Bridge at Ipswich destroyed. 4) 30 January, 1870. Floods and damage in Bowen. Clermont and Peak Downs flooded. 15 lives and thousands of sheep lost. 5) 20 February, 1870. Nearly every house in Townsville damaged with some completely unroofed. Flooding and ships sunk. 6) 24 February, 1875. Steamer Gothenberg wrecked off Cape Upstart near Ayr with 102 lives lost. 7) 17 February, 1876. Severe gales at Townsville. 8) 21 March, 1876. Heavy winds at Townsville. SS Banshee wrecked at Hinchinbrook Island with 17 people drowned. 9) 8 March, 1878. Cairns suffers huge damages. Ships Louise, Merchant, Kate Conley and Hector Miss were sunk with no survivors. 10) 2 February, 1882. Cardwell suffers considerable damage. 11) 30 January, 1884. Bowen township all unroofed. Heavy flooding to Mackay. 12) 17 February, 1888. Cyclone hits east of Mackay. Ships and houses damaged. 13) 11 March, 1890. Tropical cyclone hits Brisbane. River floods - 360mm in 24 hours. 14) 24 March, 1890. Cyclone hits Townsville. Ravenswood has 431mm rain in 24 hours. 15) 29 March, 1890. Ingham suffers damage from cyclone. 16) 2 January, 1892. Brisbane suffers damage. 17) 2 April 1892. Brisbane damaged. 18) 21 January, 1893. Brisbane homes and trees blown down. 19) 1 February, 1893. Tropical cyclone hits Yeppoon causing extreme damage. Severe floods in Ipswich and Brisbane with Indooroopilly railway bridge and Victoria bridge washed away. More than 12 deaths. 20) 11 February, 1893. Small cyclone crosses near Bustard Heads causing further flooding in Brisbane. 21) 17 February, 1893. Cyclone hits Bundaberg. Floods from Rockhampton to Grafton, NSW. Mary River bridge in Maryborough washed away with 120 houses. Cyclone induced tornado hits Sandgate. 22) 19 February, 1894. Tropical cyclones crosses east of Brisbane. 23) 26 January, 1896. CYCLONE SIGMA. Hits Townsville causing damage and severe flooding in suburbs for around 5 kilometres. 17 drowned and a sailor killed. 24) 4 February, 1898. CYCLONE ELINE. Considerable damage around Mackay. 25) 5 March, 1899. CYCLONE MAHIMA. Crosses coast at Princess Charlotte Bay. 307 fatalities of Asian and Island origin. Over 100 Aborigines were swept out to sea. Over 150 ships were sunk. Storm surge at Barrow Point was 14.6 metres. On Flinders Island, porpoises were found 15.2 metres up on the cliffs. 26) 9 March, 1903. CYCLONE LEONTA. Hurricane force winds hit Townsville. The Townsville Hospital was wrecked and the brick Grammar School was destroyed. 10 persons died. 27) 28 January, 1906. Cairns devastated. 28) 19 January, 1907. Cooktown buildings severely damaged. 29) 12 March, 1908. Widespread damage to buildings, trees, fences and telegraph lines near St Lawrence. 30) 28 January, 1910. Heavy seas and tremendous gales at Cairns. 31) 11 January, 1911. Tropical cyclone passes from the Gulf of Carpentaria INLAND and causes severe destruction at Marburg in south west Queensland. Areas suffer gale force winds. 32) 10 February, 1911. Crops and buildings damaged at Port Douglas. 33) 16 March, 1911. Port Douglas left with only 7 out of 57 houses standing. Mossman and Cairns also hit. 34) 23 March, 1911. Cyclone wrecks Yongala east of Townsville with 120 lives lost. 35) 7 April, 1912. Cairns and Innisfail have damage to structures with 40% of banana and sugar crops lost. 36) 31 January, 1913. Cyclone crosses near Cairns. Damage and flooding also to Innisfail. 4 lives lost. 37) 9 February, 1915. Bowen gets damaged. 38) 10 December, 1915. Tropical cyclone his north of Mackay. 39) 27 December, 1916. Whitsunday Island damaged. Flooding at Clermont causes loss of 62 lives. 40) 15 December, 1917. Heavy rain and gales at Bowen. 41) 21 January, 1918. Mackay hit by cyclone with almost every building damaged. A storm surge of 7.6 metres saw almost 3 metre waves breaking in the town centre. Huge flood at Rockhampton. 30 lives lost. 42) 10 March, 1918. Of 3500 residents in Innisfail only 12 houses remained. Mission Beach to the Atherton Tableland suffered destruction. Almost 100 dead. 43) 3 March, 1919. Cyclone crosses coast at Maryborough. Serious washouts. 44) 3 February, 1920. Cyclone crosses north of Cairns. Every house at Mt Molloy and Kuranda unroofed or destroyed. Widespread flooding and enormous cattle losses inland. 45) 1 April, 1921. Tropical cyclone crosses Cape York sinking boats. Heavy flooding. 46) 5 April, 1921. Bundaberg, Maryborough and Hervey Bay suffer structural damage. 47) 28 March, 1923. Cape York and the Gulf have severe wind forces. 48) 26 February, 1925. Damage to buildings at Cooktown and Mossman. 49) 9 February, 1926. Cyclone crosses near Townsville. Floods in Herbert and Tully Rivers. 50) 9 February, 1927. Tropical cyclone hits north of Cairns. Structural damage. 51) 2 April, 1927. Severe cyclone east of Gold Coast. Highest recorded tides cause disruption to shipping. 52) 14 February, 1928. Brisbane hit causing serious flooding with 5 people drowned. 53) 23 & 29 February, 1929. Two cyclones. One at Townsville the other at Mossman. Flooding. 54) 5 January, 1930. Serious flooding after cyclone crosses at Princess Charlotte Bay. Luggers in Torres Strait are sunk. 55) 20 January, 1930. Cyclone action over large part of the State finally crossing at Mossman. 6 deaths due to flooding. Huge stock losses. 56) 28 January, 1930. East of Mackay. 57) 1 - 8 February, 1931. Travels from Cooktown down to Hervey Bay causing statewide flooding. 58) 19 January, 1932. Townsville hit. Flooding from Cairns to Mackay. 59) 22 January, 1934. Cairns suffers damage and flooding. 60) 1 February, 1934. This particular cyclone travelled from the Gulf to northern NSW causing widespread damage and flooding. There was a 1.16 metre storm surge recorded as the largest on record on the Moreton Bay tide gauge. 61) 12 March, 1934. At sea many luggers and 75 lives lost as cyclone crossed coast near Cape Tribulation. 62) 22 March, 1936. Seawards of Fraser Island. 63) 16 March, 1937. Tracked from Western Australia to south-east Queensland. Severe flooding at Bundaberg and Childers. 64) 19 January, 1938. Gales at Bundaberg. 65) 27 March, 1938. Hits Bowen. Floods from Mackay to Gold Coast. 66) 27-29 January, 1939. Offshore between Rockhampton and Mackay. Flooding with stock losses. 67) 6 March, 1939. Cyclone crosses near Cape Byron. 68) 18 February, 1940. Crosses near Cardwell. Substantial wind damage in Townsville. 69) 6 March, 1940. Crosses north of Cooktown. Flooding. 70) 17 March, 1940. Cyclone causes flooding after hitting Mackay. 71) 23 March, 1940. Crossed Cape York. Tremendous Gulf flooding. 72) 7 April, 1940. Townsville and Ayr suffer damages costing $1 million (at 1940 value). 73) 8 February, 1942. Crosses north of Rockhampton. 74) 2 March, 1946. Cairns to Townsville had damage with some loss of life. 75) 4 April, 1946. East of Fraser Island causing flooding. 76) 23 January, 1947. Cyclone crossed near Caloundra with heavy gales and high seas. Flooding. 2 dead. 77) 10 February, 1947. Tropical cyclone crossed at Broadsound causing damage to infrastructure and some lives were lost. 78) 7 January, 1948. Heavy floods between Cooktown and Cardwell as cyclone crosses Cape York. 79) 28 January, 1948. Cyclone passes east of Brisbane with wind gusts up to 96 knots at Lord Howe Island. 80) 24 March, 1948. Structural damage and erosion as cyclone passes over Fraser Island. 81) 10 February, 1948. Extensive structural damage and widespread flooding when cyclone passes north of Cooktown. 82) 2-3 March, 1949. 87 knots wind gusts at Rockhampton and Gladstone. 1500 houses severely damaged. This cyclone caused damage and flooding in 15 towns. 7 deaths. 83) 15 January, 1950. Cyclone near Cooktown with gales and floods in several areas. 84) 16-19 January, 1950. Tracked from the Gulf to Sydney. 7 lives lost in NSW. 2 metre waves in Moreton Bay with houses evacuated at Sandgate. 85) 27-28 February, 1950. Crossed over Gladstone to Hervey Bay. Floods down to Brisbane. 86) 11 March, 1950. Crossed at Carmilla south of Mackay with structural damage and one death. 87) 16 November, 1950. Tropical low crosses near Brisbane causing structural damage and one death. 88) 19-24 January, 1951. Cyclone hits south east Gulf region. Major flooding to Burdekin. 89) 25-30 January, 1951. Cyclone moves around Fraser Island. Extensive damage to boats and buildings with one life lost at Caloundra. 90) 19 March, 1951. Maryborough hit. Heavy rains south-east Queensland. 91) 7 February, 1954. Tropical cyclone crosses south of Townsville producing heavy flooding. 92) 20 February, 1954. Cyclone crosses at Coolangatta. Widespread structural damage from Sunshine Coast to Gold Coast. Boats left in treetops at Beachmere. Waves at Kirra put 2 metres of water on the highway picking up cars. 900 mm rainfall recorded in 24 hours. 26 people dead. 93) 7 March, 1955. Widespread structural damage and flooding at Sarina. Lugger Barrier Princess lost with 8 people. 94) 27 March, 1955. Cyclone hits Bundaberg causing structural damage. Induced tornado hits Yandina and record flooding in the Mary River. One death. 95) 6 March, 1956. CYCLONE AGNES. Passed over Townsville. Widespread damage from Cairns to Mackay. Recorded wind gusts to 79 knots. 96) 19 February, 1957. Travelled east coast from the far north to cross at Port Macquarie in NSW. 109 knot wind gust recorded at Willis Island. 97) 20 February, 1958. Cyclone crossed the coast south of Ayr then moved back to sea. Heavy floods to Mackay with 3 lives lost. 98) 1 April, 1958. Cyclone and 2 metre storm surge hit Bowen. Wind gusts over 98 knots. Considerable damage to houses and other buildings. Other areas hit by induced tornadoes. 99) 20 January, 1959. Cyclone moved from the Gulf to cross between Cooktown and Cairns. Flooding. 100) 21 January, 1959. CYCLONE BEATRICE. Moved south to cross near Lismore, NSW causing widespread flooding. 101) 16 February, 1959. CYCLONE CONNIE. Severe wind damage at Ayr, Home Hill and Bowen where wind gusts up to 100 knots were recorded over a two hour period. Other damage in Mackay and Rockhampton. 102) 1 January, 1963. CYCLONE ANNIE. Crossed at the Sunshine Coast with houses and crops damaged. 103) 24 April, 1963. Cyclone stayed offshore but caused huge waves and erosion on south coast. 104) 13-14 January, 1964. CYCLONE AUDREY. Tracked from Gulf to Coffs Harbour causing extensive wind damage in the western areas such as St George (74 houses damaged) and Goondiwindi where over 50 buildings suffered. Glen Innes and Grafton, NSW also had wind damage. 105) 15-16 April, 1964. CYCLONE GERTIE. Hits the Whitsunday Islands with heavy coastal rain. Floods. 106) 6 December, 1964. CYCLONE FLORA. Innisfail to Cardwell reported damage. 107) 30 January, 1965. CYCLONE JUDY. Near Innisfail causing floods south to Townsville. 108) 28-30 January, 1967. CYCLONE DINAH. Severe damage at Heron Island then causing more destruction from Rockhampton to Grafton, NSW. Water knee deep in Hastings Street, Noosa from storm surge. 109) 22 February, 1967. CYCLONE BARBARA. Wind damage from Coolangatta. Crossed at Lismore, NSW. 110) 18 March, 1967. CYCLONE ELAINE. Moved past the south coast causing flooding at Logan and Brisbane with considerable beach erosion in other areas. 111) 2-4 April, 1967. CYCLONE GLENDA. Off shore of Brisbane. 16 metre waves near Gold Coast. 6 dead. 112) 17 January, 1970. CYCLONE ADA. Passed through the Whitsunday Islands to hit Airlie Beach. Tourist resorts destroyed and 80% of buildings at Airlie Beach damaged. 14 lives lost. Floods around Bowen and Mackay. 113) 16 February, 1971. CYCLONE GERTIE. Crossed at Cardwell with minimal damage. 114) 17 February, 1971. CYCLONE DORA. Crossed the coast north of Brisbane at Redcliffe. Widespread structural damage with some flooding. 115) 20-22 February, 1971. CYCLONE FIONA. Tracked from the Gulf to Rockhampton. Some damage to infrastructure. 116) 24 December, 1971. CYCLONE ALTHEA. $50 million damage (at 1971 value) caused to Townsville. 90% of houses damaged or destroyed on Magnetic Island. 3.66 metre storm surge recorded just north of the area. 3 deaths. Hundreds of homes damaged (including over 200 Housing Commission homes). 117) The reason for the WINDWORKER. See photos of damage in HISTORY. 118) 8-9 January, 1972. 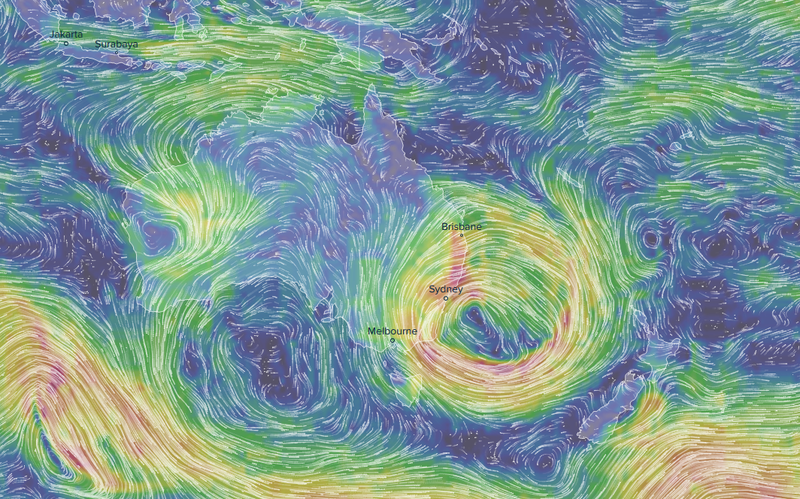 CYCLONE BRONWYN. Moved southwards throughout the State causing serious flooding isolating some towns. 119) 11 February, 1972. CYCLONE DAISY. Hit Fraser Island. Over 200 homes damaged at Pialba and other areas. Severe flooding to the Gold Coast where a peak swell height was recorded at 8.3 metres. 120) 2 April, 1972. CYCLONE EMILY. Crossed south of Gladstone. 8 people lost at sea in huge waves. 121) 4 March, 1973. CYCLONE MADGE. Hit Cooktown. Considerable flooding to Townsville. 122) 19 December, 1973. CYCLONE UNA. Crossed near Townsville. Some damage and flooding. 4 deaths. 123) 24 January, 1974. CYCLONE WANDA. Over the coast near Maryborough, it then caused significant flooding in Brisbane where 6007 homes were flooded. 13 people drowned and others died from heart attacks. The cost was $200 million (at 1974 value). 124) 6 February, 1974. CYCLONE PAM. Intense cyclone passed 500km to the east of Brisbane. Severe flooding and evacuation at Palm Beach. 125) 13 March, 1974. CYCLONE ZOE. Crossed the coast at Coolangatta then went back to sea. Floods in Brisbane with evacuations at Murwillumbah and Lismore, NSW. 126) 16 January, 1975. CYCLONE GLORIA. Stayed offshore but caused flooding from Lucinda to Mackay. 127) 19 January, 1976. CYCLONE DAVID. Passed near St Lawrence after extending from Papua New Guinea to Lord Howe Island. Buildings damaged at Yeppoon and Mt Morgan. Wind gusts were recorded at 84 knots with wave heights peaking at 9.2 metres at recording stations. 128) 1 February, 1976. CYCLONE ALAN. Crossed the North Queensland coast near Bloomfield River mission. Became an intense monsoon travelling through Tennant Creek in the Northern Territory before heading back to sea through Byron Bay, NSW. 129) 22 February, 1976. CYCLONE BETH. Over 200 homes damaged when it passed the Maryborough / Bundaberg area. Significant wave peaks recorded at 10 meters. 130) 4 March, 1976. CYCLONE COLIN. Generated huge waves along south Queensland beaches after moving south from Fraser Island to southern NSW where waves were recorded off Sydney Heads at 12 metres in height. Several launches were sunk or destroyed when 2 metre waves entered Botany Bay. 131) 5-6 March, 1976. CYCLONE DAWN. Crossed at Fraser Island causing some damage and coastal flooding. 132) 10 March, 1977. CYCLONE OTTO. Crossed at Cape Tribulation and again at Bowen. Aggravated flood damage in Cairns . 133) 31 January, 1977. CYCLONE KEITH. Hit east of Cairns and the crossed again at Cape Cleveland near Townsville. Extensive crop damage. 134) 1-2 January, 1979. CYCLONE PETER. Record rainfall south of Cairns (1140mm in 24 hours) caused serious flooding estimated at $10 million (at 1979 value). 2 deaths. 135) 11 January, 1979. CYCLONE GRETA. Crossed Princess Charlotte Bay. 136) 1 March, 1979. CYCLONE KERRY. Passed the coast near Proserpine. Some damage around Mackay and resort islands. Wind gust recorded at 76 knots. $1 million damage (at 1979 value) to boats in harbour. 137) 7-8 January, 1980. CYCLONE PAUL. Near St Lawrence causing record floods around Bowen. Wave peaks recorded at Brisbane station at 9.8 metres. 138) 12-14 February, 1980. CYCLONE RUTH. Remained at sea between Australia and New Caledonia. 139) 24 February, 1980. CYCLONE SIMON. Passed near Fraser Island with wind gusts over 100 knots. Structural damage at Hervey Bay. Wave peaks recorded at 8.9 metres. 140) 10 February, 1981. CYCLONE EDDIE. Crossed at Princess Charlotte Bay. 141) 15 February, 1981. CYCLONE CLIFF. Crossed over Fraser Island to Bundaberg. Flooding to Gold Coast. 142) 26 February, 1981. CYCLONE FREDA. Developed near Cooktown and moved away from the coast. 143) 3-4 March, 1983. CYCLONE ELINOR. Hit near Carmilla causing minimal damage to houses. 144) 8 March, 1984. CYCLONE JIM. Crossed the Peninsula Coast near Cape Grenville with foliage damage. 145) 19 March, 1984. CYCLONE KATHY. Crossed the Peninsula Coast near the Pascoe River. 146) 7-9 April, 1984. CYCLONE LANCE. Gold Coast suffered wind and rain damage to homes and high rise buildings. Peak wave heights at Brisbane station recorded at 8.8 metres. 147) 22 February, 1985. CYCLONE PIERRE. Hit Shoalwater Bay. Minor flooding. 148) 1 April, 1985. CYCLONE TANYA. Crossed the Peninsula Coast at Coen. Vegetation damage. 149) 1 February, 1986. CYCLONE WINIFRED. Crossed near Innisfail with an eye diameter of 41km. A wind gust was calculated at 145 knots. Houses damaged. Cost was $130 million (at 1986 value). 3 deaths. 150) 1 March, 1988. CYCLONE CHARLIE. Made landfall at Upstart Bay near Ayr. Wind gusts recorded to 80 knots. Some structural damage and flooding at Ayr. 151) 4 April, 1989. CYCLONE AIVU. Building damage costs were $40 million while agriculture costs were $40 million and $10 in infrastructure (at 1989 values). Major flooding. One death. 152) 3 February, 1990. CYCLONE NANCY. Crossed near Byron Bay in NSW. 73 knot winds recorded near Brisbane. Flash flooding in Queensland and NSW caused 4 deaths and costs reached $36 million. 153) 19 March, 1990. CYCLONE IVOR. Passed the coast near Princess Charlotte Bay with some damage in Coen. As a monsoon moved south to cause extensive flooding at Yeppoon. 154) 22-25 December, 1990. CYCLONE JOY. Travelled past Cairns to weaken in intensity crossing at Townsville. 97 knot wind gusts recorded. Structural damage south of Cairns. Induced tornado hit Mackay damaging buildings and causing floods. 6 lives lost. Cost $62 million (1990 value). 156) 13 January, 1992. CYCLONE BETSY. Passed seaward of Fraser Island. Caused beach erosion. 157) 16 March, 1992. CYCLONE FRAN. Crossed near Town of 1770 leaving structural damage in Bundaberg. Wind speed at 76 knots and major flooding. Cost $10 million. 158) 17 March, 1993. CYCLONE ROGER. Passed close to Fraser Island before moving back to sea and south towards NSW. Sunshine Coast sustained damage while winds and seas closed the Port of Brisbane. Brisbane station recorded waves at 13.2 meters. 159) 20 January, 1994. CYCLONE REWA. Stayed 100km off the coast but caused flash flooding around Brisbane which resulted in 4 deaths. 160) 8 March, 1995. CYCLONE VIOLET. Passed close to Lord Howe Island before weakening near Byron Bay, NSW. 161) 9 January, 1996. CYCLONE BARRY. Moved down from the Gulf past Sarina to Hervey Bay causing structural and vegetation damage. 162) 27 January, 1996. CYCLONE CELESTE. Came close to Bowen with an eye of 40km. wind gusts to 64 knots and some damage to buildings. 163) 12 March, 1996. CYCLONE ETHEL. Crossed at Cape Melville. 60 knot winds reported. 164) 9 March 1997. CYCLONE JUSTIN I. Large cyclone but stayed offshore. Mackay wave station recorded peak wave measurements at 8.45 meters. Some wind damage around the Whitsunday Group. 165) 22 March, 1997. CYCLONE JUSTIN II. Crossed near Cairns. Wind damage to buildings from the Atherton Tablelands to Townsville. Considerable flooding and evacuations. Cost almost $200 million. 166) 10-11 January,1998. CYCLONE SID. Moved from Gulf across Cape York and intensified into a monsoon low near Townsville. Severe flooding and landslides. Peak wave height recorded at 5.41 metres. Total damage cost over $100 million (at 1998 value). 167) 26 March, 1998. CYCLONE YALI. Passed seawards off Brisbane heading south. Wind gusts of 54 knots and peak wave height recorded at 11.5 metres. Beach erosion from Sunshine Coast to Northern NSW. 168) 11 February, 1999. CYCLONE RONA. Made landfall near the mouth of the Daintree River. Considerable vegetation damage. Maximum wind gust was 85 knots and the peak wave height recorded was 6.3 metres. Cost of crop and infrastructure damage estimated at $150 million. 169) 27 February, 2000. CYCLONE STEVE. The cyclone passed the coast at the nothern beaches of Cairns causing structural damage and flooding. Wind gusts up to 85 knots were recorded and the peak wave measurement was 5 metres at Cairns Wave Recording Station. Prominent buildings were unroofed. Mareeba reached a record flood level of 12.4 metres and evacuations were conducted. 170) 17 March, 2000. Tropical low created gales around Lucinda. Record flooding occurred at Giru. 171) 2 April, 2000. CYCLONE TESSI. Crossed north of Townsville causing extensive crop damage and to some isolated buildings in the area. Townsville then suffered wind damage to buildings and widespread flooding. 70 knot winds recorded. 172) 28 March - 7 April, 2000. CYCLONE VAUGHN. Wind gust to 34 knots. No significant damage. 173) 15 - 16 February, 2001. CYCLONE WYLVA. Hovered around Mornington Island but caused very little damage. Maximum wind gust recorded was 64 knots. 174) 23 - 27 February, 2001. CYCLONE ABIGAIL. Crossed north-west of Cairns at Ellis Beach before entering the Gulf and reforming before crossing the coast again near the Queensland / Northern Territory border. Some damage was sustained on Mornington Island where the wave surge was 1.3 metres and the Maximum wind gust was 64 knots. Both Cairns and Green Island had considerable winds to 50 knots. 175) SOSE 5 - 12 April 2001. Although the cyclone remained far offshore, large seas and high tides affected Queensland causing erosion and waves up to 4.8metres. There were two drowning near the Town of 1770. 176) BENI 2 - 5 February 2003. Beni caused floods from Rockhampton to the Gold Coast causing $10M worth of damage to public infrastructure. Waves were recorded to 8.5metres. 178) Hybrid Cyclone 5 March 2004. Waves to 14.2metres recorded off Stradbroke Island. Severe flooding from Sunshine Coast through Brisbane to Gold Coast. 179) 19 - 24 March 2004.CYCLONE GRACE Flooding between Cairns and Cooktown. 372mm of rainfall in 24 hours. Wind speeds up to 54 knots were recorded. Estimated US$20M damage to Cairns region. 182) 25 - 30 Jan 2006 CYCLONE JIM. 183) 23 Feb 2006 CYCLONE KATE. Torres Straight. 184) 17 - 21 March 2006 CYCLONE LARRY. Innisfail and Atherton Tableland. 185) 16 - 27 APRIL 2006 CYCLONE MONICA. Cape York. 186) 5-7Feb 2007 Nelson. Gulf to Cape york. 2) 26 - 28 April, 1867. Southeast Queensland flooded. Wharves covered in Brisbane. Brisbane, Logan and Ipswich suffer structural and tree damage. Bridge at Ipswich destroyed. 3) 11 March, 1890. Tropical cyclone hits Brisbane. River floods - 360mm in 24 hours. 4) 2 January, 1892. Brisbane suffers damage. 5) 2 April 1892. Brisbane damaged. 6) 21 January, 1893. Brisbane homes and trees blown down. 7) 1 February, 1893. Tropical cyclone hits Yeppoon causing extreme damage. Severe floods in Ipswich and Brisbane with Indooroopilly railway bridge and Victoria bridge washed away. More than 12 deaths. 8) 11 February, 1893. Small cyclone crosses near Bustard Heads causing further flooding in Brisbane. 9) 17 February, 1893. Cyclone hits Bundaberg. Floods from Rockhampton to Grafton, NSW. Mary River bridge in Maryborough washed away with 120 houses. Cyclone induced tornado hits Sandgate. 10) 19 February, 1894. Tropical cyclones crosses east of Brisbane. 11) 5 April, 1921. Bundaberg, Maryborough and Hervey Bay suffer structural damage. 12) 2 April, 1927. Severe cyclone east of Gold Coast. Highest recorded tides cause disruption to shipping. 13) 14 February, 1928. Brisbane hit causing serious flooding with 5 people drowned. 14) 1 - 8 February, 1931. Travels from Cooktown down to Hervey Bay causing statewide flooding. 15) 1 February, 1934. This particular cyclone travelled from the Gulf to northern NSW causing widespread damage and flooding. There was a 1.16 metre storm surge recorded as the largest on record on the Moreton Bay tide gauge. 16) 22 March, 1936. Seawards of Fraser Island. 17) 16 March, 1937. Tracked from Western Australia to south-east Queensland. Severe flooding at Bundaberg and Childers. 18) 4 April, 1946. East of Fraser Island causing flooding. 19) 23 January, 1947. Cyclone crossed near Caloundra with heavy gales and high seas. Flooding. 2 dead. 20) 10 February, 1947. Tropical cyclone crossed at Broadsound causing damage to infrastructure and some lives were lost. 22) 28 January, 1948. Cyclone passes east of Brisbane with wind gusts up to 96 knots at Lord Howe Island. 23) 24 March, 1948. Structural damage and erosion as cyclone passes over Fraser Island. 24) 16-19 January, 1950. Tracked from the Gulf to Sydney. 7 lives lost in NSW. 2 metre waves in Moreton Bay with houses evacuated at Sandgate. 25) 27-28 February, 1950. Crossed over Gladstone to Hervey Bay. Floods down to Brisbane. 26) 16 November, 1950. Tropical low crosses near Brisbane causing structural damage and one death. 27) 25-30 January, 1951. Cyclone moves around Fraser Island. Extensive damage to boats and buildings with one life lost at Caloundra. 28) 19 March, 1951. Maryborough hit. Heavy rains south-east Queensland. 29) 20 February, 1954. Cyclone crosses at Coolangatta. Widespread structural damage from Sunshine Coast to Gold Coast. Boats left in treetops at Beachmere. Waves at Kirra put 2 metres of water on the highway picking up cars. 900 mm rainfall recorded in 24 hours. 26 people dead. 30) 19 February, 1957. Travelled east coast from the far north to cross at Port Macquarie in NSW. 109 knot wind gust recorded at Willis Island. 31) 21 January, 1959. CYCLONE BEATRICE. Moved south to cross near Lismore, NSW causing widespread flooding. 32) 1 January, 1963. CYCLONE ANNIE. Crossed at the Sunshine Coast with houses and crops damaged. 34) 24 April, 1963. Cyclone stayed offshore but caused huge waves and erosion on south coast. 35) 13-14 January, 1964. CYCLONE AUDREY. Tracked from Gulf to Coffs Harbour causing extensive wind damage in the western areas such as St George (74 houses damaged) and Goondiwindi where over 50 buildings suffered. Glen Innes and Grafton, NSW also had wind damage. 36) 28-30 January, 1967. CYCLONE DINAH. Severe damage at Heron Island then causing more destruction from Rockhampton to Grafton, NSW. Water knee deep in Hastings Street, Noosa from storm surge. 37) 22 February, 1967. CYCLONE BARBARA. Wind damage from Coolangatta. Crossed at Lismore, NSW. 38) 18 March, 1967. CYCLONE ELAINE. Moved past the south coast causing flooding at Logan and Brisbane with considerable beach erosion in other areas. 39) 2-4 April, 1967. CYCLONE GLENDA. Off shore of Brisbane. 16 metre waves near Gold Coast. 6 dead. 40) 17 February, 1971. CYCLONE DORA. Crossed the coast north of Brisbane at Redcliffe. Widespread structural damage with some flooding. 41) 24 January, 1974. CYCLONE WANDA. Over the coast near Maryborough, it then caused significant flooding in Brisbane where 6007 homes were flooded. 13 people drowned and others died from heart attacks. The cost was $200 million (at 1974 value). 42) 6 February, 1974. CYCLONE PAM. Intense cyclone passed 500km to the east of Brisbane. Severe flooding and evacuation at Palm Beach. 43) 13 March, 1974. CYCLONE ZOE. Crossed the coast at Coolangatta then went back to sea. Floods in Brisbane with evacuations at Murwillumbah and Lismore, NSW. 44) 22 February, 1976. CYCLONE BETH. Over 200 homes damaged when it passed the Maryborough / Bundaberg area. Significant wave peaks recorded at 10 meters. 45) 4 March, 1976. CYCLONE COLIN. Generated huge waves along south Queensland beaches after moving south from Fraser Island to southern NSW where waves were recorded off Sydney Heads at 12 metres in height. Several launches were sunk or destroyed when 2 metre waves entered Botany Bay. 46) 5-6 March, 1976. CYCLONE DAWN. Crossed at Fraser Island causing some damage and coastal flooding. 47) 24 February, 1980. CYCLONE SIMON. Passed near Fraser Island with wind gusts over 100 knots. Structural damage at Hervey Bay. Wave peaks recorded at 8.9 metres. 49) 7-9 April, 1984. CYCLONE LANCE. Gold Coast suffered wind and rain damage to homes and high rise buildings. Peak wave heights at Brisbane station recorded at 8.8 metres. 50) 3 February, 1990. CYCLONE NANCY. Crossed near Byron Bay in NSW. 73 knot winds recorded near Brisbane. Flash flooding in Queensland and NSW caused 4 deaths and costs reached $36 million. 51) 13 January, 1992. CYCLONE BETSY. Passed seaward of Fraser Island. Caused beach erosion. 52) 17 March, 1993. CYCLONE ROGER. Passed close to Fraser Island before moving back to sea and south towards NSW. Sunshine Coast sustained damage while winds and seas closed the Port of Brisbane. Brisbane station recorded waves at 13.2 meters. 53) 20 January, 1994. CYCLONE REWA. Stayed 100km off the coast but caused flash flooding around Brisbane which resulted in 4 deaths. 54) 8 March, 1995. CYCLONE VIOLET. Passed close to Lord Howe Island before weakening near Byron Bay, NSW. 55) 9 January, 1996. CYCLONE BARRY. Moved down from the Gulf past Sarina to Hervey Bay causing structural and vegetation damage. 56) 26 March, 1998. CYCLONE YALI. Passed seawards off Brisbane heading south. Wind gusts of 54 knots and peak wave height recorded at 11.5 metres. Beach erosion from Sunshine Coast to Northern NSW. 57) BENI 2 - 5 February 2003. Beni caused floods from Rockhampton to the Gold Coast causing $10M worth of damage to public infrastructure. Waves were recorded to 8.5metres. 58) Hybrid Cyclone 5 March 2004. Waves to 14.2metres recorded off Stradbroke Island. Severe flooding from Sunshine Coast through Brisbane to Gold Coast. A useful link to radar around Australia. Darwin monsoon documentary - a great show for aviation enthusiasts as well.. 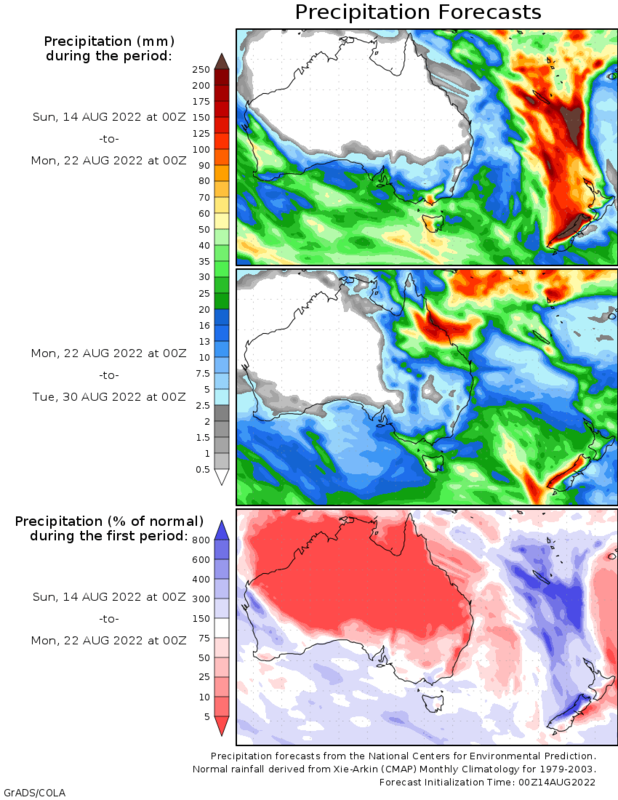 Active through the traditional cyclone season, this site shows the statistical probability of cyclone development around Aus over the next few weeks. Put together in collaboration with the BoM. Interesting background info and verification also linked on the site. Looks like you can only view that link from inside the BoM? Says "You are forbidden from accessing this page"
I'm getting the same message here. That's because it came online from this morning (Wed) as mentioned in my post (assuming you tried to load it on Tue night?). So you should now be able to view it. Haha that's my bad. Next time I'll actually read what's posted. Found this one.....not much info but some unbelievable photos of severe weather. Added those to the first post. http://www.meteo.nc/espro/previcycl/cyclA.php?type=gen#2 Statisctical porobability of cyclones occuring. It might be handy to have a section of links specifically for archived satellite images. I know one of these sites has already been mentioned but it might be worth specifically pointing out its use for animating archived satellite imagery. http://realtime2.bsch.au.com/vis_sat.html - Provides animation of archived MTSAT-1R images for the Australian region including the colorized IR images for the last 14 days. http://internationalweatherarchive.org/satViewer.aspx - Provides animation of archived MTSAT-1R IR and visible full-disk images for what appears to be at least the last 2 months and possibly longer. As a beginner, I found this quite useful, thanks. Led me to what I found to be interesting info on "Model error trends" which although focuses on Atlantic region, I imagine would still indicate general model trends? Please feel free to correct me if I'm wrong, or remove if unsuitable. I did a seach and couldnt find it in the forum so i hope it hasnt been posted already, does a good forcast/loop with surface winds etc. http://www.mapsofworld.com/lat_long/australia/australia-lat-long.html Find you Latitude/longitude in Australia. A good site for viewing intensity. I am going to try that again. The link worked well, then I tried to insert another link and it went haywire. Found this website whilst looking for webcam info... I haven't delved into it - but it looks interesting for QLD Tropical peeps. Also some Aussie Webcam sites..
Hi all, this is my site of which I have been operating in Townsville since 2003. The site is also about to launch it's new design on the 1st December 2011. It also has a HD Live stream of Townsville's weather 24 hrs a day. See below for the link. Just a couple I have found lately..
www.switchbanks.com.au/satellite.html is my favourite weather site. Women & Weather !!!! Here's a heap Ken Kato put up elsewhere. Just had a look at the the gfs model on bsch. Going way out to the end of the 7 days (after seeming to go eddy crazy) it developes 2 systems. Both are rather tight and small too. The set up is rather interesting. The picture I would like to see is the sst map for post Dylan coral sea. Overall I know you can count these runs to be completely different tomorrow but it still paints a picture of some exciting weather. 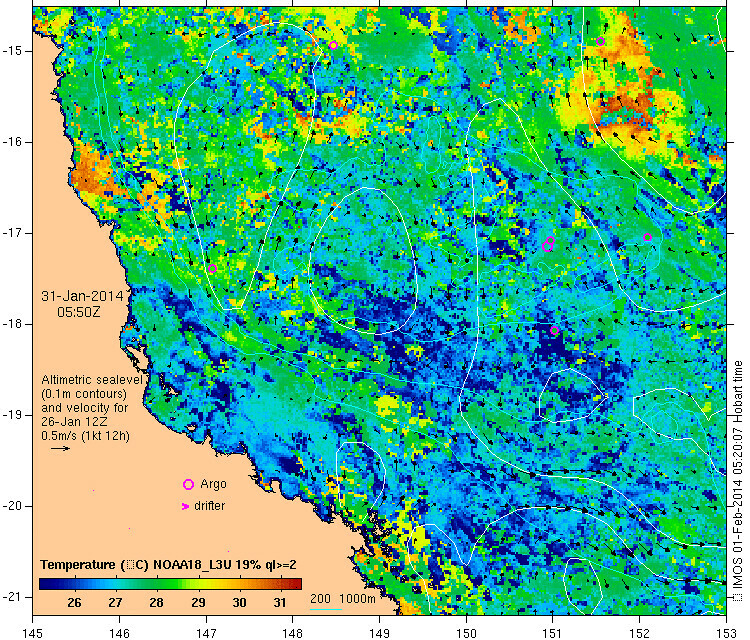 I've included an example from the CSIRO below (off the north tropical coast for yesterday). The SST's are colour-shaded (the white contours represent sea level & the black arrows represent direction/speed of surface currents). I just thought I would pop in and revive this thread, as some time has passed without any updates. I guess lately, due to the cyclone season I have found many people posting fantastic images and I have headed off to try and find the source on the internet, sometimes with no luck. And with each new cyclone season new sites/resources pop up that some people aren't aware of, but would be interested in. I personally can put a number on here, but I must add these are links that I have managed to find from other posters. And as some of these are bookmarks they will be linking to past systems in existence, but should get you in the ballpark. http://www.hfip.org/products/ 9Clicking Ensemble storms tracks gives a nice image - but it does involve some effort to get anything at times. And another is http://hurricanes.ral.ucar.edu/realtime/current/ (This shows any system in ation and once clicked on you can get access to various plots). Generated in 0.039 seconds in which 0.003 seconds were spent on a total of 13 queries. Zlib compression disabled.